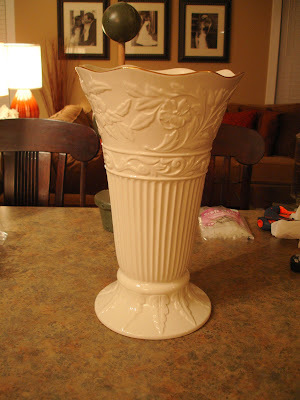 My friend, and fellow thrifter, presented me with this vase to fill. She wasn't sure what to put in it because it was so large. She found it for a great deal at Goodwill. So, I started thinking and the idea popped into my head to make a topiary. I've never made one before but I figured it couldn't be that hard. 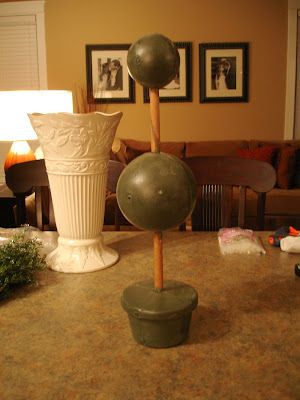 So, I went to hobby lobby with the intention of buying some styrofoam balls and using some dowels to connect them (which you could do) but they had this great topiary form and I had a 40% off coupon. 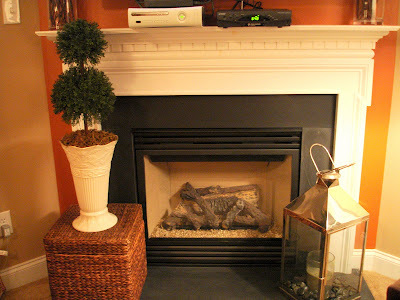 They also had some boxwood on sale for 50% off and I just love the way boxwood looks. It looks really bright in this picture because I had to use the flash. 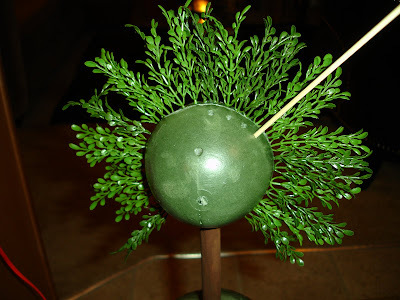 I plucked the little branches off the main bush one by one and then poked several holes in the styrofoam with a skewer to help them go in easier. Then before I stuck the little branches in the styrofoam, I applied a little bit of hot glue to ensure that they would stay. 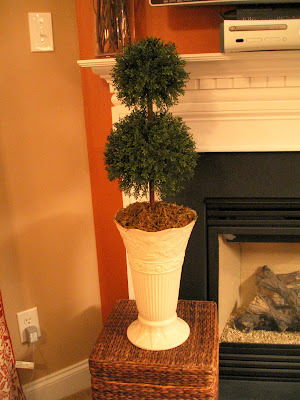 I love the way topiaries look and the possibilites are endless as far as what you can put on them. I think the ones with fruit or flowers look great too! I almost lost it a couple times :) I didn't do it all at once or I'm sure I would have!